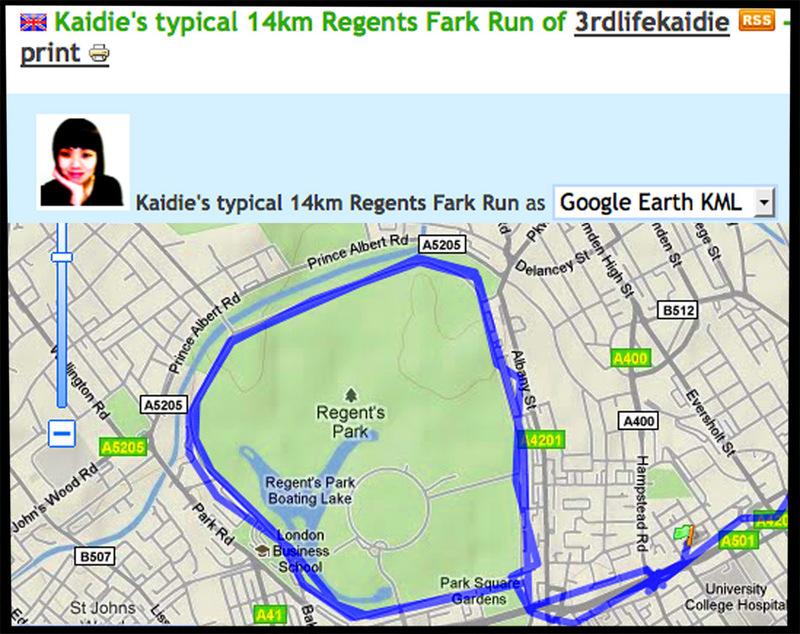 A ROUGH GUIDE TO REGENT’S FARK: KAIDIE’S MOOMOODYMOODMOOD MAP OF HER TYPICAL RUN AT HER FAVOURITE FARK. You can take a look at the same route tracked sehr scientifically using GPS on my page in GPSies – albeit ending up at my local Pesco’s to buy 35 tubs of some of my favourite jellied eel. Starting from last week, however, Kaidie has upped her training to 1 more loop, in preparation for her first ever Life 1.0 marathon in September, making it a total of about 18km under 2 hours each time. More updates about the race soon! Watch this space. Don’t you dare blink. This entry was posted on Sunday, May 16th, 2010 at 20:20	and is filed under GETTING THERE: RUNNING, NONDON A-Z and tagged with between life & death, cycles, happiness, meaning of life, run, samsara, themes/variations, travelling. You can follow any responses to this entry through the RSS 2.0 feed. You can leave a response, or trackback from your own site. all meanderings are unconscious drawings of constellations, it’s true! You have to watch ducks and pigeons in particular to see this vividly, but it’s true I tell you! I should let my winged friends wear my GPS and make meandering GPS drawings for me! But I will have to clingfilm my Garmin first to make it waterproof. Please have a lovely day too, Desnos!